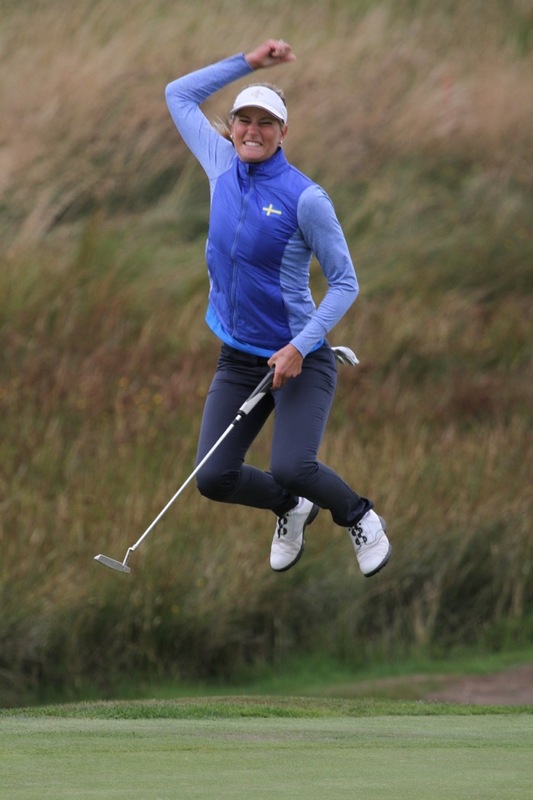 Last week, when I realised that Padraig Harrington was in with a chance of winning his first tournament in quite a while, I plonked myself in the armchair to cheer him on and found myself captivated by a rather lovely Italian called Andrea Pavan. I have to confess that I thought he was French at first because one of the on-course How’s it lying Clives called him Andre – or at least that’s what I heard – but I twigged eventually. So it was Viva Italia once again and another second place for Padraig to add to his impressive collection. 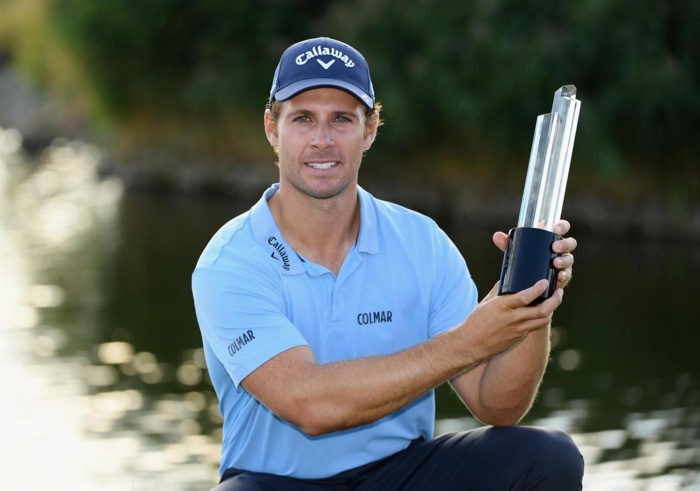 I was disappointed that he didn’t win but delighted that Andrea, who looked ecstatic, dazed and amazed all at once, had snatched his maiden European Tour victory in grand style, coming home in 31, five under par, with birdies at the 10th, 12th, 14th, 16th and 17th. Then they showed the leaderboard and I was so ecstatic, dazed and amazed all at once that I went, “Wow, that’s fantastic,” out loud. That’s what happens when you live on your own, you talk to yourself, some of it profound (?! ), a lot of it rubbish. Some sort of slippery slope I suppose. Anyway, what impressed me was the diversity, the way that golf has worked its way in to pretty well every corner of the globe. Root out your atlas and we’ll work our way down the leaderboard at the D+D REAL Czech Masters at Albatross Golf Resort, Prague. Golf in Prague, for goodness sake and this is how the final standings read, by country: Italy, Ireland, Malaysia, England, Scotland, South Africa, India, Sweden, France, Denmark, USA, Belgium, Thailand, Austria, Spain, Australia, Zimbabwe, Greece, South Korea, Germany. By my reckoning (taking into account ageing eyes, titchy print and the inevitable margin for error of the mathematically challenged), there were 20 countries represented in the top 30 places. Wow. Fantastic. That’s what I call a global tour. At the golf club the other day I happened to mention that the World Amateur Team Championships were in Ireland over the next two weeks and wasn’t that exciting. Dead silence. No one knew what I was talking about. I’m a fan of the WATCs because Maureen played in the Espirito Santo (the women’s version) at Pinehurst in 1980 and I met Dai (dear reader, I married him) at the Eisenhower Trophy (the men’s comp) that year. It’s a big thing, not least because of the numbers involved. At Carton House, near Maynooth in county Kildare, women from 57 countries are competing and next week there’ll be 71 men’s teams. GB and I’s 1974 Espirito Santo team in the Dominican Republic. 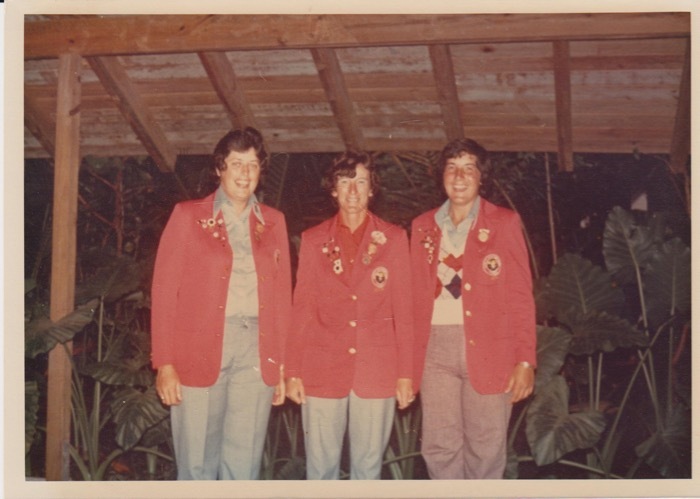 From left to right: Mary McKenna (Ireland), Julia Greenhalgh (England), Tegwen Perkins (Wales). Why the jersey Teg? For many years Ireland, Wales, Scotland and England combined as GB and I (Great Britain and Ireland) but now they enter as separate entities. Mo’s was a GB and I team that consisted of her, Mary McKenna and Belle Robertson, with Maire O’Donnell from Donegal as captain. McKenna was injured just before the start and Jane Connachan, a very young Scot, was drafted in to replace her. At least now 12 players have a chance to take part instead of three and two years ago, in Mexico, Ireland’s women won the bronze medal, a great effort. They’ll have to go some to match that this year after the USA rocketed into first place after the 2nd round, posting a total of 272, one shot ahead of South Korea (officially the Republic of Korea), the defending champions and two ahead of Japan. 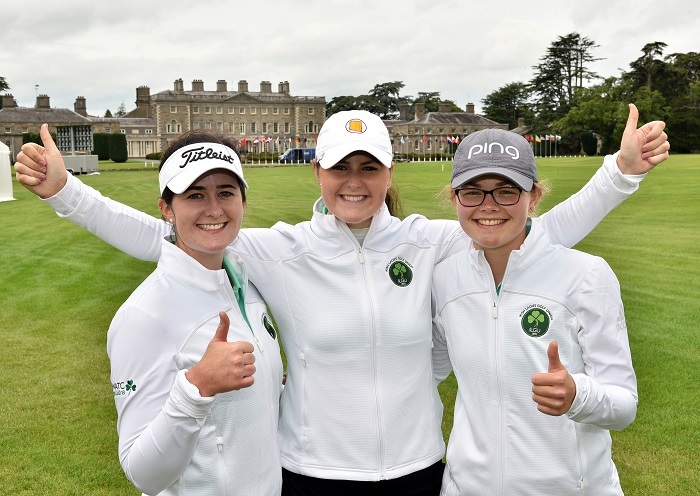 Ireland’s team of Olivia Mehaffey, Annabel Wilson and Paula Grant were on 288, sharing 10th place with Mexico. Wilson, an ebullient teenager, had a 74, one over par, on the O’Meara course yesterday but was overshadowed by her playing partners Jennifer Kupcho and Ayean Cho, who had 65 and 64 respectively. Kupcho, from Colorado, is ranked No 1 in the world and the Korean Cho’s 64 was the lowest score of the week. Kupcho’s teammate Kristen Gillman also had a 65 so Lilia Vu, the third American, found her score of 69, four under par, discounted! It’s a tough school. Looking ahead to 2020, when the Curtis Cup will be held in Conwy, north Wales, not far from where I’m writing this, Elaine Ratcliffe has been named as captain. Hooray. 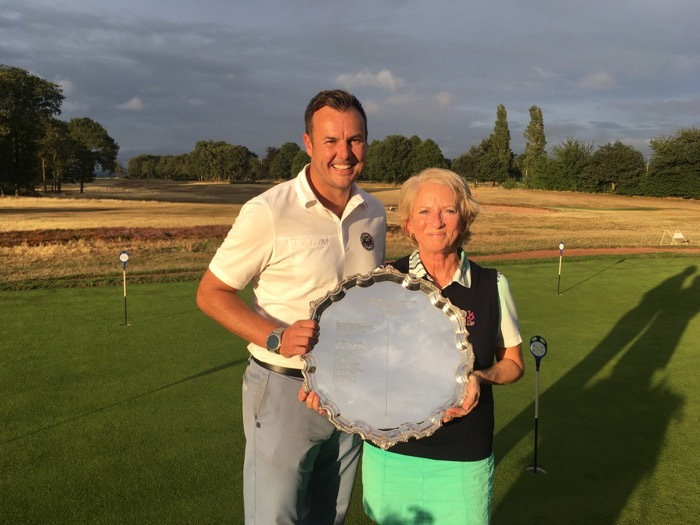 The personable Englishwoman, who’s from Cheshire originally, had a distinguished amateur career before turning professional but was reinstated as an amateur in 2008 and has captained England teams at various levels. She’ll also lead the Vagliano Trophy and Astor Trophy teams next year. And Ireland’s Maria Dunne will captain GB and I in next year’s Junior Vagliano Trophy at Royal St George’s. Hooray again. 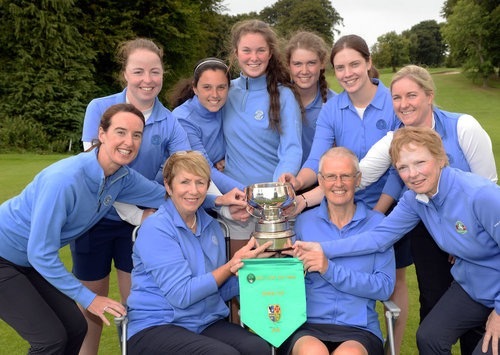 Finally, the team of the month award must go to Lahinch, whose women won the All-Ireland Senior Cup for the first time when they tonked Elm Park 4 1/2 – 1/2 in the final at Knock GC in Belfast. It’s a fantastic achievement and I trust the team and their supporters will be celebrating for a while yet. 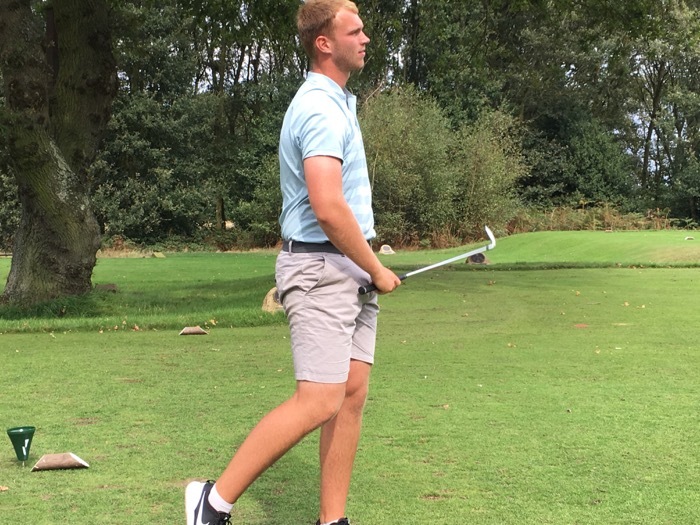 Ryan Brooks, a former club champion at Whittington Heath, who has hopes of making it to European Tour School, had a hole-in-one at our 4th hole yesterday but it was not just any old hole-in-one; it was hard-earned, taking as it did nearly a day of unremitting toil. Remember the agonies of Edoardo Molinari, brother of Francesco, the Open champion, when he was given 500 goes to achieve a hole-in-one and failed? Edoardo hit the pin at least once and came agonisingly close on several other occasions but he didn’t make it and at the end collapsed flat on his back on the tee. It’s well worth a look on YouTube. Apparently the odds on a professional golfer scoring a hole-in-one are 2,500 to 1, so they are relatively rare beasts and feted accordingly. Ryan (right) taking a breather, not too long before he holed-in-one at the 716th attempt. Ryan may not reach the heights of a Woman’s Hour feature but his was a monumental feat nonetheless. He holed out with his 716th shot (roughly 10 rounds worth) and was out there beating balls for six hours and eight minutes. The 4th measures 172 yards from the white tees and he teed off just in front of them, using a mat to save tearing up the turf. His club of choice was “a soft 8-iron”. I was there for shot No 700 and Ryan had a nice rhythm going, pausing only to let members and visitors play through. If only I’d stayed a little longer! 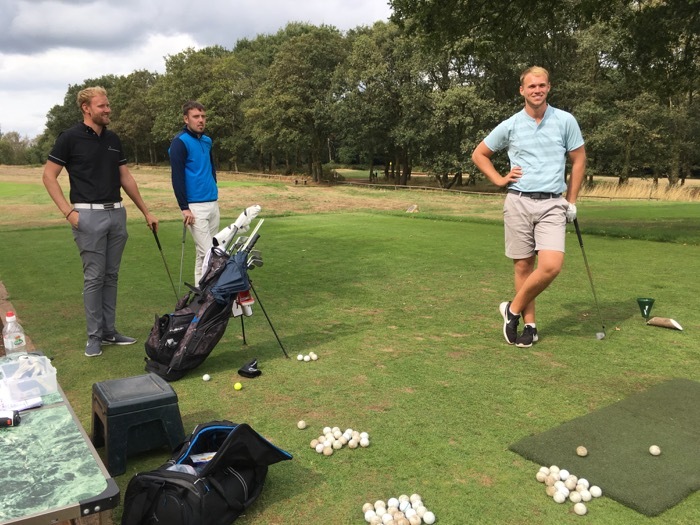 Ryan took centre stage because the Pros’ Charity Challenge, an annual feat of endurance and record breaking undertaken for the captains’ charity, had to be postponed because Mike Raj, our head pro, was poorly. He and Dan Whitby-Smith were to spend 12 hours – from 0730 to 1930 – playing the course, on foot, with only one club each. They’d both decided on a 7-iron but, who knows, that could be subject to change now that they have more time to think. Why on earth are they attempting this? Well, they’re both lovely men if completely daft and every year they rack their brains to come up with something suitably demanding to boost the charity coffers and leave them on their knees. It’s The Alzheimer’s Society this year. Last Sunday, we had a charity cricket match at Tamworth Cricket, Hockey and Squash Club, a ground usually graced by more skilled performers than some of us on view. We did have proper cricketers on each side but they had to dumb down for the women who had never learned to play and the children who were just starting. At least it meant that I was bowled at underarm, with a soft ball, so did not have to wear pads (have you ever tried walking in pads, let alone running in them?) Somehow I scored 7 runs and managed to avoid doing much in the field other than retrieving the ball (a proper, hard, red cricket ball) from the hedge. I hadn’t appreciated that you’d have real trouble playing cricket if you were colour-blind. Aren’t red and green the colours that cause the most problems? 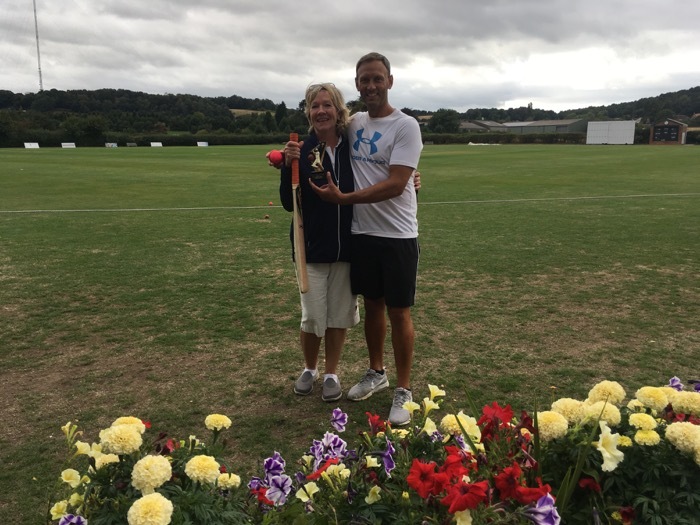 Anyway, somehow, despite having only eight players in the field, we managed to win and Karen Crarer, the ladies’ captain, received the trophy from Mike Raj. Karen Crarer, not in the least shamefaced, accepts the trophy from Mike. I suppose I’d better explain the lovely image at the top of the blog. It’s to celebrate my most exciting moment of the week – I know, I know: Get A Life……..I came home yesterday to find an intriguing parcel in the postbox. What on earth had I been sending for? Aren’t I meant to be saving up for some long-haul trips and limiting my non-essential spending? Well, I removed the packaging, put it in the recycling (I would have inserted that annoying emoji with the halo but couldn’t work out how to do it on this machine) and screeched with joy. There was a slim, dark navy blue tin with the Spurs logo on it and not a Nike swish in sight, thank goodness. 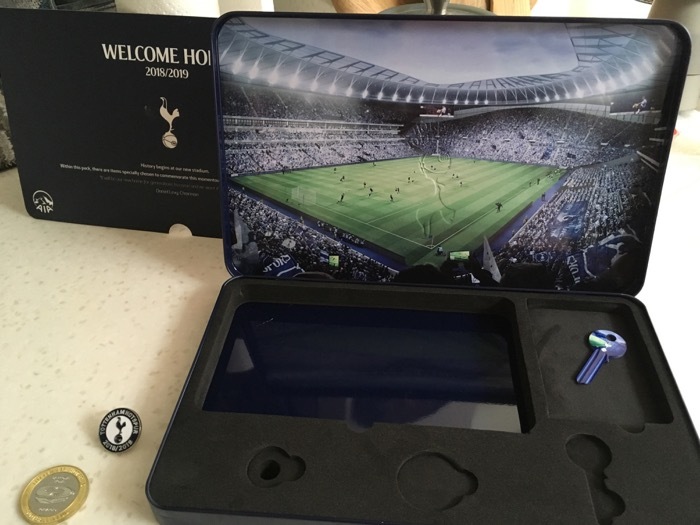 There are few things I like better than a good tin and this one has a picture of our new stadium on the inside of the lid, oh dreams of glory, glory days ahead! White Hart Lane’s replacement, “our new home” as it’s referred to pending the right deal…..
Just one last word, about Tiger versus Phil in Las Vegas in November. Why? No, don’t even try to explain or justify it. My first last word was Yuk. And I think that’ll do. I double checked that it’s a bona fide word, in the dictionary, so that’s me expressing extreme distaste or disgust and total disinterest. And that really will be my last word on the matter. I see that the lovely Brandt Snedeker (the computer nearly slipped in the surname Sneaker) has had a 59 in the first round of the Wyndham Championship at Sedgefield Country Club in Greensboro, North Carolina. Well done him. He holed a 20-foot putt at his last hole (the 9th) to hit the magic mark, to finish 11 under par. I have to admit that when I switched on the telly yesterday afternoon to have a look at the golf (NOW tv is doing one of its Sky Sports deals, so I was tempted in), I noticed that Snedeker, who was on the 9th hole, had a wee (-10) by his name. That can’t be right I thought, it must be something to do with his place in the FedEx Cup standings or some such esoteric thing. Even though one of his playing partners then had (E), for even, beside his name, I dismissed it and switched off! More fool me but at least I can console myself with the thought that I really was there, on the golf course, in person, when Annika Sorenstam had her 59 at Moon Valley, in Phoenix, Arizona, all those years ago. Snedeker has joined a distinguished and not all that long list on the PGA Tour but Annika is still up there (or down there) on her own on the LPGA. Ali Gibb, of Croham Hurst, who had three holes-in-one in one day, more than most of us manage in a lifetime. She won the comp. Still, pride of place this week must go to Ali Gibb, a 51-year old, six-handicap member of Croham Hurst GC in South Croydon, Surrey. 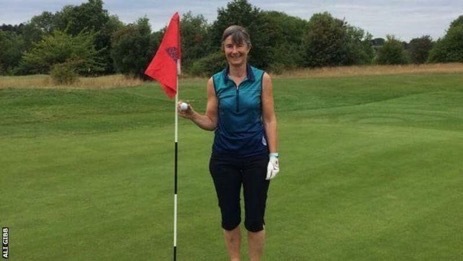 Last Tuesday, she became the club champion for the umpteenth time but, remarkably, in her 36 holes, she recorded THREE holes-in-one. That’s right, she HOLED IN ONE THREE TIMES in two rounds, twice at the 5th, 127 yards and once at the 11th, 160 yards. Well done Ali on the golfing achievement of the week. 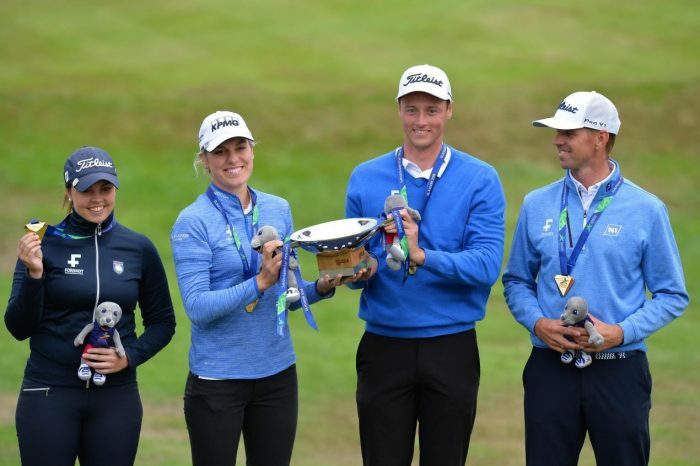 Congrats also to Iceland, who won the mixed team event in the European Championships on the PGA Centenary Course at Gleneagles. Vladis Thora Jonsdottir, Birgir Hafthorsson, Olafia Kristinsdottir and Axel Boasson were the gold medallists, a shot ahead of the Great Britain 3 quartet of Meghan MacLaren, Liam Johnston, Michele Thomson and Connor Syme. The men’s gold was won by Pedro Oriol and Scott Fernandez of Spain and the women’s by Sweden’s Linda Wessberg and Cajsa Persson. Darren Hall and Helena, ace villain, Rean with the spoils of victory. Does the putting green look familiar? 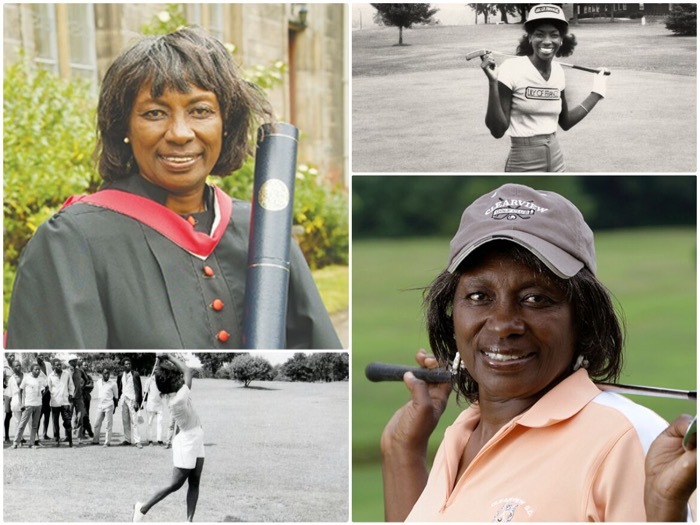 I don’t know if Renee Powell and Katharine Whitehorn, two formidable women from different spheres, have met yet but they’re about to be immortalised at the home of golf by the University of St Andrews, founded in 1413, which is giving them a hall of residence each. Renee Powell Hall, 205 rooms and Whitehorn Hall, 184 rooms, are due to open in October. 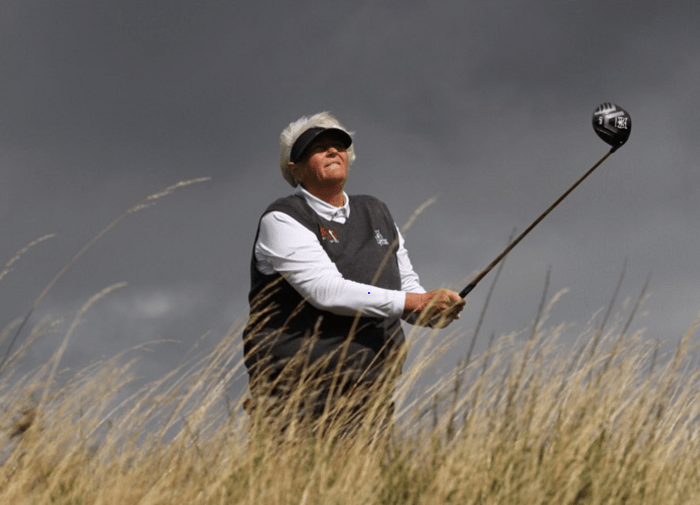 Powell was given an honorary degree by the university in 2008 and in 2015 she became one of the first female members of the R&A. She was the second African American to play on the LPGA tour and is now a renowned teacher, specialising not just in golf but in life. Whitehorn, a CBE and giant of journalism, is a graduate of Newnham College, Cambridge and was elected (by the students) rector of the University of St Andrews in 1982, the first woman to hold the post. I nearly spoke to her once when I spotted her at a Women In Journalism get-together but my courage (always in short supply) failed me. After all, would she really want some gibbering eejit stuttering, “You’re Katharine Whitehorn. I think you’re wonderful, an inspiration. And Cooking In A Bedsit helped me through uni.” No wonder I bottled it. But Cooking In A Bedsit, a small, battered, bespattered paperback that has departed this world (or at least my copy has), was a lifesaver, wherever it may rank in the great woman’s oeuvre. Finally, I couldn’t resist using this photo for its sheer, unadulterated joy. The golf at the European Championships may have been a bit low key for most of us but it really mattered to those taking part. And that’s what counts.